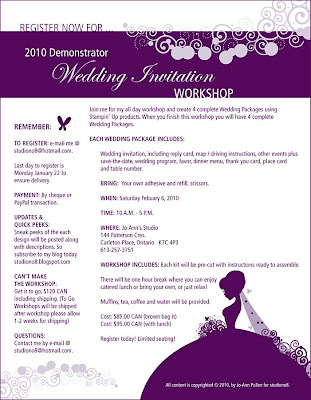 Registration is Officially Open for 2010 Demonstrator Wedding Workshop. Join me for my all day workshop and create 4 complete Wedding Packages using Stampin’ Up products. When you finish this workshop you will have 4 complete Wedding Packages. Wedding invitation, including reply card, map / driving instructions, other events plus save-the-date, wedding program, favor, dinner menu, thank you card, place card and table number. BRING: Your own adhesive and refill, scissors. WORKSHOP INCLUDES: Each kit will be pre-cut with instructions ready to assemble. There will be one hour break where you can enjoy catered lunch or bring your own, or just relax! Muffins, tea, coffee and water will be provided. TO REGISTER: e-mail me @ studiono8@hotmail.com. Last day to register is Monday January 25 to ensure delivery. PAYMENT: By cheque or PayPal transaction. Check out these samples all made with Stampin' Up Products. Sure wish I lived in Canada!